The 27.43 expedition yacht Rosa, listed for sale by John DeCaro at All Ocean Yachts, has had a further $500,000 price reduction. Built in aluminium by Canadian yard ABD Aluminium Yachts to a design by AG McIlwain she was delivered in 1996 with several refits since, including a major $2.5 million upgrade in 2014/2015. Accommodation is for seven guests in three very generous cabins consisting of a master suite on the upper deck with its own private covered deck, and two doubles on the main deck, one with a large settee that converts into a single berth. All cabins have WiFi internet access, entertainment centres, television screens and en suite bathroom facilities. The crew's quarters are on the main deck forward and have a complete galley and lounge area with two crew cabins for a total of four crew. The main saloon features a large sectional sofa, two overstuffed occasional chairs, a dining table with chairs, a full service wet bar and an entertainment centre including a 52 inch Samsung LCD television screen. This area is well lit with natural light from the large windows and in 2014 hardwood floors were installed. Forward and opposite the galley is a breakfast settee for four guests, offering a comfortable area for relaxed snacks through the day. The sheltered aft deck has a gas barbecue grill, fridge and a large settee with a mahogany table, suitable for al fresco dining seating six or more guests. The lower deck level of this yacht for sale consists of five watertight bulkhead compartments and is totally dedicated to engineering, service and stowage spaces. Twin 310hp Caterpillar engines give her a cruising speed of 9 knots, a range of 5,000 nautical miles and she is fitted with zero speed stabilizers. 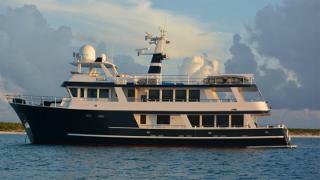 Lying in Fort Lauderdale, Florida, Rosa is down from $3,995,000 to $3,495,000.